Review by Charlotte A Morgan. Nigerian born artist Leo Asemota’s The Ens Project is a body of work informed by three key historical and critical influences; the industrial revolution and British Empire under Victorian rule, the practice of Igue, an ancient head worship ritual from Benin, and Walter Benjamin’s essay The Work of Art in the Age if it’s Technological Reproducability, which explores the potential for the mechanical reproduction of art to destroy it’s exclusivity and reverence as a commodity. These references signal a complex investigation of the spirituality and ideology that defines our understanding of global social, psychological, economic and cultural phenomena, and the influence of technology upon them. Fittingly the project’s ‘First Principles’, which date from 2005-8, appeared as an exploded map of associated, linked and intersected points in visual, textual and object form. 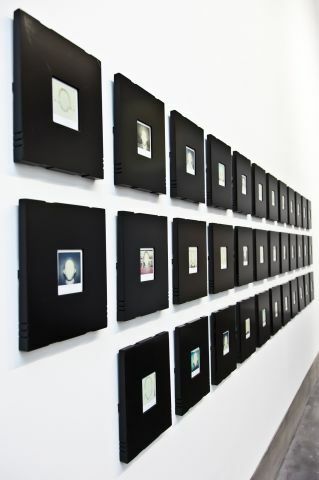 Adjacent to the gallery entrance, a series of Polaroid photographs entitled Stage 1 – A circle in the (w)Hole depicted the head of a man whose identity is rendered ambiguous by the bleaching of the facial area on the print, as though over-exposed. Their subject is the artist, using a familiar approach to documenting the passage of time. 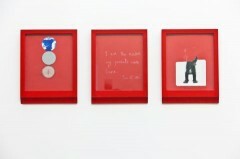 Stage 3 – Misfortunes Wealth is comprised of a series of logos, diagrams and texts in Kaolin chalk, graphite and coal predominantly red, ivory and black in their content or framing. While in the UK coal may represent the rise and ultimate demise of large scale industry and remind us of labour, dirt, privatisation and profit, we learn that in Benin culture coal is sacred. With a similar aesthetic consideration, Stage 6 – An Ending, A Beginning; Part 1, Part 2, Part 3 includes drawings, plans, collages, documents and objects relating to two performances: readings in different languages of three theoretical and poetic texts including Benjamin’s essay by characters named ‘Agents of the Union’ at The National Portrait Gallery, and a walk taken in traditional Nigerian military dress which followed the route made by the diamond jubilee procession of Queen Victoria, the figurehead of both the industrial revolution and the British capture of Benin. For Stage 4 – After Walter: A Transmission in Two Acts, Asemota broadcast an interpretation of Benjamin’s essay on Resonance FM through which he aimed to embody “the artist as transmitter of information”. Of integrity to this presentation was its relative opacity. As a secondary audience we had little insight into how this broadcast rethought The Work of Art…, or whether it related to Benjamin’s radio monologues, stories of troubled social and political situations delivered for children on German Radio. However, the presentation of only documents relating to the broadcast emphasised the transience of the performance and radio’s ability to inhabit multiple spaces, reach unknown audiences and create intimacy through disembodied voices. Although we are shown fragments of the preformance works through video footage and photographs, the emphasis lay on understanding the work as part of a whole that embodies and incorporates research – a constellation of suggestions, associations, propositions and interventions. In learning of The Handmaiden, an invented character explored in second phase of The Ens Project and Eo Ipso, a multimedia live work in which the project will culminate, the exhibition of Phase 1 emerges as a preliminary presentation and a means through which the artist could summarise, validate and realise future directions for the project. This model of research and/as practice would be limited if the exhibition were used to convey and conclude a linear argument. However, the work was at times confused by it’s unclear critical position on the project’s key influences and their relation to the present context. 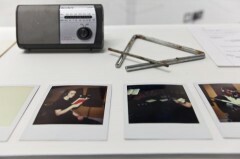 The choice of an online arts radio station, the use of instant photography to “enrich the aesthetic” and the complex structure applied to the ‘project’ and it’s definition as such – titles within titles, works within works, all within stages and phases of a grand narrative, allude to the significance of unique objects, mystical or nostalgic aesthetics and a sense of profundity and affect, which are problematic without critical clarity in relation to Benjamin’s ideas on the democratisation of the art object and the diminishing of it’s aura. Whether or not these formally and conceptually linked works could be easier understood as practice rather than project, they invite us to allow ourselves to be told a story, encountered as fragments that intelligently entwine fact and fiction. It is a story specific to the artist yet one which merges with our psychological and spiritual experiences, encounters with technology and a senses of place. The artist’s physical presence in much of the work reflects the project’s agenda to explore the “essential self in light of scientific and industrial advances”. 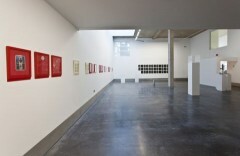 While inviting criticisms relating to narcissism or the revered figure of the male artist, Asemota’s employment of the body to perform or represent ideas is a strategy in unravelling provenance and the formation of identity; his autobiographical references look towards global relations and commonalities. How can the essential self be commonly defined? 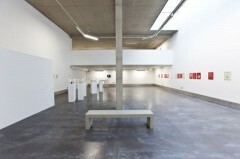 Interweaving personal and theoretical narratives, The Ens Project presents dualities and dichotomies, purposefully unsettling initial interpretations of it’s materials and references and the seemingly conflicting ideologies attached to them, while reflecting the complex negotiation of contemporary life. COPY is a platform for writing and publishing in the field of visual art and performence, co-initiated by Joanna Loveday and Charlotte A Morgan.